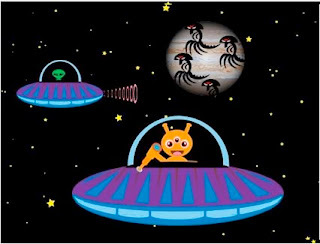 StoryJumper is another exciting webspace where children can write stories for an authentic audience. There are several options with StoryJumper. The free service allows you to create your own stories, save them, email them to a friend. Eventually, you will be able to order print copies that you then pay for. The premium membership gives you more options. But the free version is perfect for kids and parents who'd like to have some fun with an online story editor that provides art work for you. I chose to create a book about space. I deleted the text that was already there, and created my own. What a great opportunity for children to invent their own narrative about the scenes and props! Once my story, Aliens!, was made, I could send the link to my friends via email. Kids are also able to read books made by others online for free, or personalise and purchase them.